From stitching an important partnership with Virat Kohli to taking India close to the doors of victory, Hardik Pandya's innings showed his class and composure as a player. Most people had the same opinion about Hardik Pandya six months back. He was talented. He had immense potential. He was India’s future star. Yet, he was still not the all-rounder on whom India could depend on. He couldn’t stop himself from going for big shots in the most adverse situations and that often led to his downfall as a batsman. Moreover, he bowled short, strayed in line and length and went for hefty runs most of the times. Making him a dependable player was a work in progress and it seemed like it would take quite long to grow him into the all-rounder that India needed. However, nobody would have thought that he would go on to make a massive improvement as a player in a span of just six months. With his innings of 76 off 43 deliveries on the night of the Champions Trophy final in June and innings of 83 off 66 deliveries in the first ODI of the ongoing series against Australia, he had shown that he had finally come of age as a player. He showed that India could depend on him. Both of those innings came while batting at No 7. However, on Sunday, he was given a chance to show his mettle higher up the order. And he didn’t disappoint the Indian coach and captain as his versatile nature as a player came to the fore. He was sent out to bat at No 4 with India still requiring 147 runs to win and seal a series victory. What he produced was another gem of an innings. 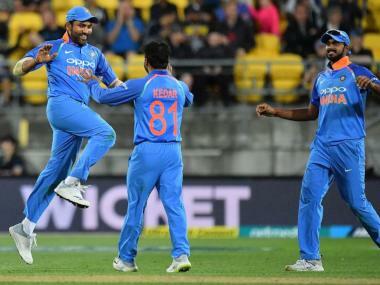 The move took Australia completely by surprise as he walked out to bat ahead of Manish Pandey, Kedar Jadhav and MS Dhoni. Rohit Sharma and Ajinkya Rahane had set up a good platform with a 139-run opening stand. However, their wickets in quick succession had left India in a confusing state at 147/2. Pandey was expected to come next but he hadn’t done anything of significance in the first two ODIs batting at that position. So, India decided to try someone new at that position despite knowing that the result of the match was at stake. The result was a beautiful innings of 78 of just 72 deliveries from Hardik that helped India to victory once again. He had shown in the first ODI that he had the ability to dig in and rotate the strike when the situation demands. However, Dhoni's presence at the crease and his advice had made the task easier for Hardik. This time, he had his skipper Virat Kohli as his partner at the other end. However, this time the message wasn't to dig in but to maintain a steady run rate. The idea was not letting Ashton Agar settle down as spinners had a fair chance of being lethal on that pitch. Hardik took the task to his hand and kept attacking Agar. He stitched a 59-run stand with Kohli as the Indian scoreboard read 203/2 in the 36th over with India just 91 runs away from winning the series. However, India were jolted with double strikes at that moment. Kohli and Jadhav departed in quick succession leaving India at 206/4 and victory still 88 runs away with as many deliveries remaining. A question must have crossed people's minds — does Hardik have the ability to see it through for India? This was answered 75 deliveries later. Pandey had walked out to bat at No 6. He had a lean patch in the series so far and was low on morale and confidence. 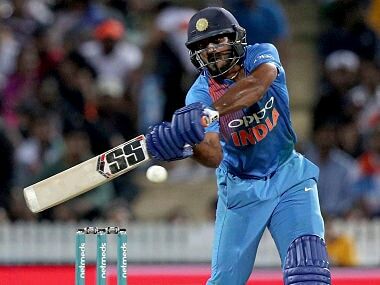 In such circumstances, Hardik's responsibility increased further as he had to maintain the required run rate along with ensuring that India don't lose any more wickets. Hardik adapted to the situation and handled everything with immense maturity. He mixed caution with aggression. He rotated the strike and again went for big shots whenever the run rate crept up. Pandey ended up with a unbeaten 36 to his name at a run-a-ball. But, that wouldn't have been possible if Hardik wouldn't have taken the pressure off him. The 23-year-old all-rounder couldn't remain unbeaten till the end. However, by the time he departed, India were just 10 runs away from victory with 25 deliveries to their expense. He ended up as the top scorer of the match with 78 runs to his name off 72 deliveries.The innings included five fours and four huge sixes as well. That gives an idea about how well he dominated the Australian bowling attack. This innings was testament to Hardik's versatility as a batsman. He proved that he wasn't only a player who could play only in one gear. The fact that he had a mature head and good game awareness was visible in the way he played. From stitching an important partnership with Kohli to taking India close to the doors of victory, along with giving Pandey the confidence to hang around with him, is a proof of his class, calm and composure as a player. He has now made a statement that he is here to stay.